With the festive season upon us, many of us want our teeth to be looking their best! For a brighter smile, teeth whitening is a popular option. Although, it with so many products available it can become confusing to determine which is the right treatment to choose. 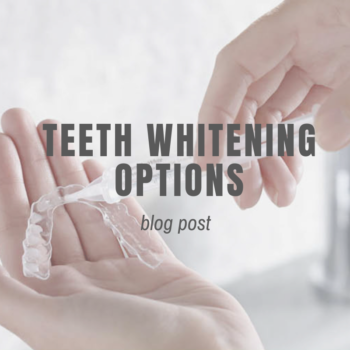 There are many cheap whitening options available online and over-the-counter, although these often do not generate the best results and some may even be damaging in the long run. Having your teeth whitened by a dental professional is the best way to ensure safe process with long lasting, positive results. Professional dental whitening services also penetrate the enamel of the tooth, lifting deeper stains than those just on the surface. Take-home teeth whitening is an option that can be carried out in the comfort of your own home. After a consult with one of our Dentists, impressions of your teeth will be taken and a custom-fit tray will be created for you in-house. You will then have the freedom to whiten your teeth at home gradually and may expect to see results in as little as one-two weeks, with the ability to top-up your whitening at any time. In-Chair teeth whitening gives a more instant result. This option is perfect for those who have an upcoming event that they would like a brighter smile for. At Aim Dental, we use the Phillips Zoom whitening treatment that is administered and monitored by a dental professional, allowing a stronger and more effective solution to be used. If you are interested in teeth whitening, book your consult online today or call us on 1300 AIM DENTAL. This entry was posted in Oral Health Insights. Bookmark the permalink.